You may remember that our last issue of Hope Notes began with an interview with the Waktola family of Sasiga, Ethiopia. They enthusiastically told us that having coffee with friends and neighbours was the number one thing they did for fun. So we decided to dig a little deeper into where that comes from. 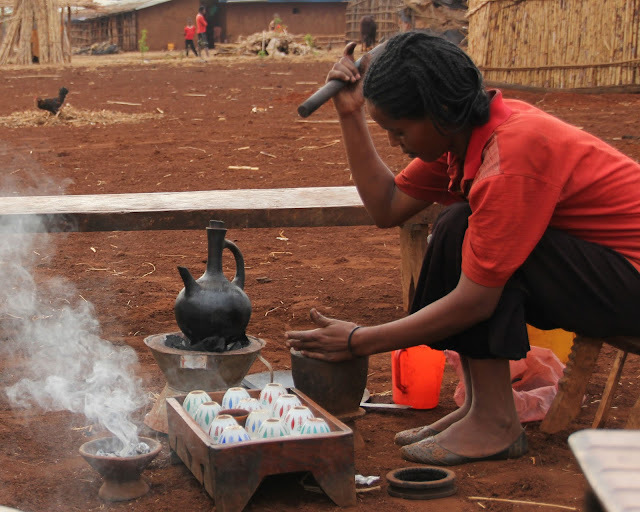 We quickly discovered the origins of coffee are varied, but it may very well have been discovered in Ethiopia. One legend claims a goat herder noticed the energizing effects a coffee plant’s red berries had on his animals. So, he took the fruit to a local monastery. At first, the monks disapproved of the berries and their effect, and threw them into a fire, only to find the aroma of burning beans quite enticing. They soon employed the roasted beans in their “tea” to stay alert during prayer. There isn’t a lot of historical data to back this story up. Other legends claim it was a traveling religious leader who came upon energetic little birds eating from a coffee berry bush. Another claims an exiled healer boiled the berries in desperation for a meal. And yet another claims tribes would chew the berries for nutrition and the habit spread with the slave trade. Whatever the case, coffee is around to stay. 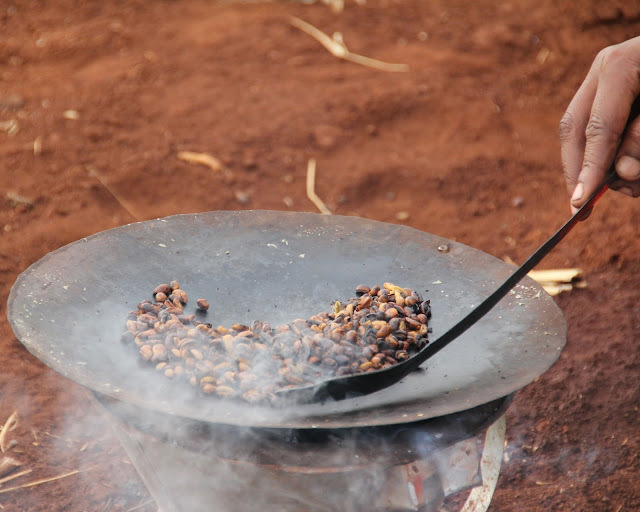 Some sources estimate farmers in East Africa were roasting cups of joe as early as 575 A.D.
Today, we need our coffee. Canada frequently scores in the top 10 for greatest consumption per capita in the world. And we prepare it any number of ways - from the precisely titrated pour-over at the local hipster coffee bar to the classic double-double at Timmy’s. 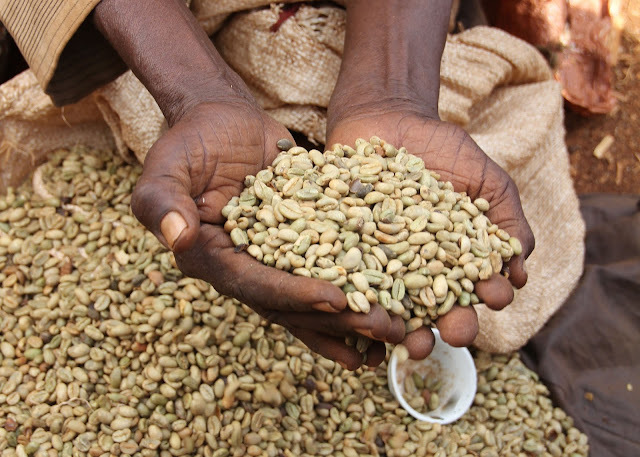 But if you’re looking for arguably the purest way to prepare coffee, let’s go back to its source: Ethiopia. Coffee and Ethiopia go together. It is one of Ethiopia’s largest exports, and is part of daily life in a way much more raw and beautiful than the convenience-driven hustle of Canadian life. 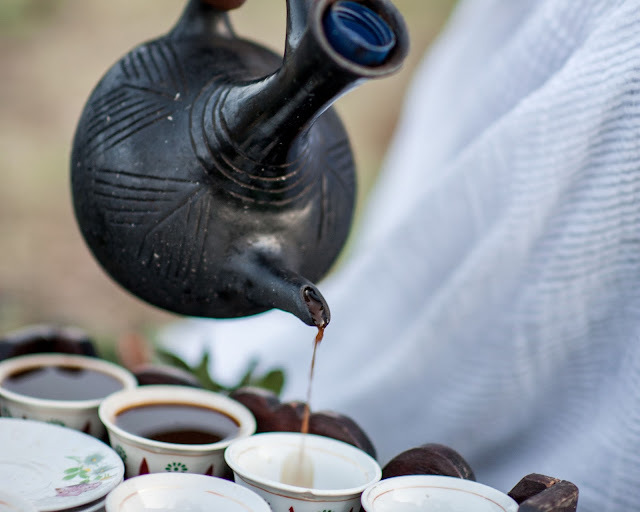 The Ethiopian coffee ceremony is an important cultural ritual that has been passed down for generations. Practically, the ceremony involves preparing the beans to bring out their best flavours. Philosophically, the ceremony teaches patience, and places importance on being with your neighbours and enjoying a warm beverage together to start or end a day of busyness and toil. 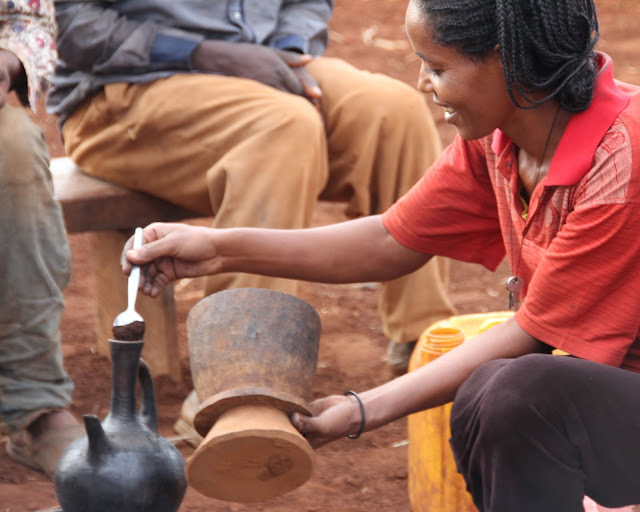 Ethiopian men and women do not rush “coffee time”; rather it is at the heart of their community. In many villages, families gather daily around a communal fire to prepare coffee and talk farming, share hardships, discuss faith, laugh, and pass on their family history. STEP 1: Choose your coffee beans. STEP 2: Roast beans over a charcoal fire. STEP 3: Grind beans with a mukecha and zenezena (mortar and pestle). STEP 4: Add grounds to Jabena full of hot water - steep for 10 minutes. STEP 5: Add sugar, honey, cloves, cardamom, salt, or butter to taste. Enjoy!